Step 1. Connected the Ubiquiti PicoM2 to a computer using a CAT5 Ethernet cable. Step 2. Open firefox or Chrome web-browser and type the default IP address 192.168.1.20 into the web address bar, and make sure your computer is in the same IP address range, example 192.168.1.22 and you will see a login web page like the picture below. Step 4. 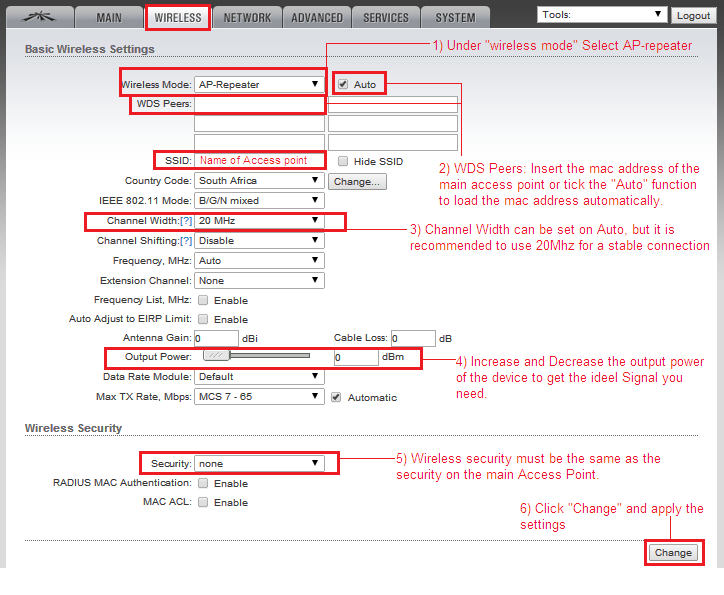 Go to the Wireless tab and follow the steps as indicated in the following screenshot. Since MiRO was founded in South Africa in 2003, we have grown to be amongst Southern Africa’s leading distributors of Wireless, Networking, VoIP and IP Video products. We believe that IP technology is the future of communication and that it should be easily accessible for everyone. Our team of IP convergence professionals are here to take your business to the next level - we empower you to connect communities.